If you are in the position of deciding whether or not to donate the organs and tissues of someone you love, you may have many questions. This article answers some of the most common questions and concerns you may have. The demand for organs far outweighs the number available for transplantation and thousands pass away each year while waiting for a second chance at life. As the national waiting list continues to grow, the number of organ donors has remained relatively unchanged over the past several years. According to the United Network for Organ Sharing, there are nearly 70,000 people waiting for transplants in the United States alone. Given the current donation rates, less than half of those waiting will ever be transplanted. In the United States, a new name is added to the transplant waiting list every 16 minutes. While a national list does not exist for those waiting for tissue grafts and corneal transplants, there is a great need for donations of both tissues and eyes. Each year donors provide tissue for approximately 450,000 tissue grafting procedures, including hip replacements, heart valve transplants and ligament repairs. Last year more than 46,000 cornea transplants were also performed in the United States. If a person is declared brain dead, the following information maybe helpful to you. Brain death means there is no blood flow or oxygen to the brain and that the brain is no longer functioning in any capacity and never will again. The person cannot breathe without assistance, has no pupil response to light and no response to pain. Failure of many organs begins to occur soon after brain death. The heart has its own “pacemaker and it will continue to beat as long as it has oxygen. Respiratory support equipment supplies oxygen and keeps the heart beating. Once a patient is brain dead, he or she is dead. The brain will never recover. During a short time after brain death, while a respirator keeps the heart beating, some of the patient’s organs and tissues may be recovered for transplant. People who have died what is termed a “cardiac” death cannot donate organs but may still be tissue and eye donors. If your family decides to give permission for organ and tissue donation, you will first be given an opportunity to say goodbye to your loved one. Use these minutes to hold and touch the body of the person you have loved one final time. The organ procurement team will then evaluate the patient as a donor and blood samples will be taken for the matching process. When recipients are located, organs and tissues will be removed by a team of surgeons and a specialist trained in organ recovery. The entire process can take between 10-30 hours. The recovery of organs and tissue is a surgical procedure and takes place in a hospital operating room. The person donating is cared for respectfully throughout the entire procedure. The recovery of organs and tissue is a surgical procedure so an incision or incisions will be made. However, the incisions are typically small and will be covered with clothing for the funeral. 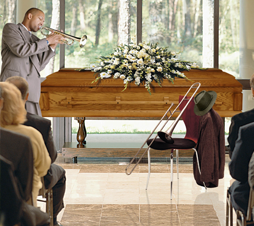 You may still have an open casket visitation or funeral if you wish. If you should decide donation is right for you, you will want to consider what clothing would be best for an open casket viewing. You may want to let others know that your loved one was a donor by including this information in the obituary, the funeral program or the eulogy. Ask your funeral director for ideas. Families of potential organ and tissue donors typically experience the sudden, often traumatic, demise of someone they love. For all families the death is senseless. Some families must also cope with the knowledge that death resulted from the violent act of another or a self-inflicted wound. The unique circumstances surrounding the catastrophic injury that led to brain death creates special needs for these families. Given no time to prepare and often little experience coping with such devastating news, donor families are in need of immediate and ongoing support. Acknowledging the reality of the death is often complicated by the very nature of the death- brain death. A previously healthy person now lies motionless in a hospital bed with vital signs, yet a family is asked to comprehend and accept the irreversible nature of the injury and finality of the situation. A family may desire time with the body and reassurance that all medical treatment options have been exhausted. No one should rush or pressure you into the decision to donate. However, you should be aware of time constraints that might prevent you from donating certain organs or tissues if too much time elapses. Take the time to talk among yourselves, openly and honestly, about your feelings about donation. Consider what the dying person would have wanted. Listen to what your heart and mind are telling you to do. The United Network for Organ Sharing (UNOS) website (www.unos.org) provides good information on national statistics, legislation, and policy on donation. For information specifically pertaining to tissue and eye donation, the American Association of Tissue Banks and the Eye Bank Association of America would be useful resources. Additionally, the National Kidney Foundation Donor Family Council has a variety of resources specifically for donor families at (800) 622-9010 or www.kidney.org.